Conrad Martens Plumbing and Hot Water provide affordable, reliable service to Brisbane’s South. Our emergency plumbers have extensive history working in the area and are highly trained to ensure the highest level of service possible. We offer a guarantee to provide our customers with the best price, service and advise possible. With over twenty vehicles in our fleet, you can guarantee we are only ever a short distance away. Our large referral base in Brisbane South is made up of a range of Private, Body Corporate and Real Estate Customers. 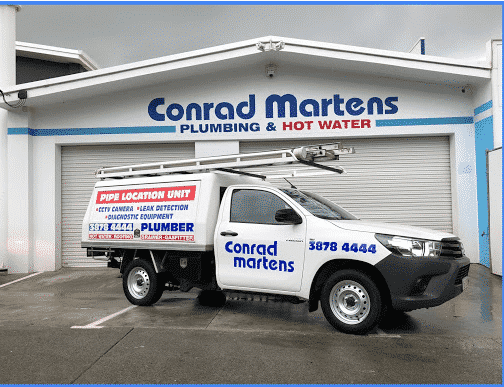 If you require emergency assistance, or are looking for a reliable Plumber Brisbane Southside, look no further then Conrad Martens Plumbing and Hot Water. All brand hot water system repairs, servicing and replacements including Rheem, Dux and Rinnai. Hot water plumbers fully equipped with hot water valves, thermostats and elements for electric, heat pumps, gas and solar water heaters. Competitive hot water system prices backed up with a guarantee to beat any competitor’s comparable quote. Hot water emergency service is also available to the Brisbane southside for any after hours hot water problems. From concealed underground leaks to burst pipes we can detect and fix all your water leaks on the Brisbane southside. Our licensed plumbers can accurately locate the source of water leaks underground, under driveways and concrete slabs using specialised water leak detection equipment. Professional drain cleaning service by licensed plumbers for the Brisbane southside to rectify all your sewer and stormwater drain problems. Utilising the electric eel, plunger or sanisnake, our drain specialists will provide the best solution to clear, repair or replace your blocked drains. Emergency after hours plumber available for any urgent after hours blocked drains. Specialised CCTV drain camera service for identifying the cause of drainage issues and the drain locations. CCTV drain camera allows us to view inside the sewer or stormwater drain to pinpoint the exact cause of the drainage issue. We can then provide the best options for sewer or stormwater repair, replacement or ongoing maintenance. Our licenced plumbers stock a variety replacement parts to service and repair a wide array of taps, mixers and toilets. When replacing or upgrading to new tapware, mixers or toilets our experienced plumbers will offer the best solutions and advice. Water efficiency testing is available to identify effective solutions to save water or comply with rental property standards for water charging. We provide speedy service to the Brisbane southside for all kitchen appliance plumbing problems such as jammed garbage disposals, leaking dishwasher hoses and water filter cartridge replacement. Our plumbers are experienced in new installations of kitchen appliances including icemaker fridges, dishwashers and garbage disposal units. As maintenance plumbers, we specialise in repairs to gutters, roofs, downpipes and stormwater lines. Our extensive experience with fault finding enables us to find those hard to locate roof leaks and stormwater drainage issues. Fully licensed to test, repair, replace and install all makes and models of backflow prevention devices, RPZ valves (reduced pressure zone devices) and thermostatic mixing valves. Licensed gas fitters experienced in repairs, servicing and replacement of all gas appliances including gas cookers, stoves, cooktops and gas hot water systems. Their service also extends to gas leak detection, gas service repairs, upgrades and fault finding. Highgate Hill 4101 and Fairfield 4103 are located within 5 kilometres of the CBD and consist of mainly residential housing and apartment buildings. A common plumbing problem we attend to in the area i s concealed water leaks within apartment buildings. Our experienced Brisbane south plumbers and leak detection specialists are highly skilled and locating and repairing the source of water leaks. If you live in Highgate Hill 4101 or Fairfield 4103 and are experiencing a water leak in your apartment or at your house, call our Plumbers Brisbane Southside emergency service. The suburbs of Dutton Park 4102 and Norman Park 4170 are located approximately 4 kilometres from the Brisbane CBD. This close proximity allows our Plumbers Brisbane Southside to provide a rapid response time. As predominantly residential suburbs, the majority of our works in the area include maintenance plumbing, gas fitting and water heater servicing. Tarragindi 4121, Coorparoo 4151 and Norman Park 4170 are older, predominantly residential suburbs within our Plumbers Brisbane southside service area. We experience a large volume of blocked drains in the area as a result of the older style eartherware sewerage pipes. Made predominantly made of clay and mortar, earthenware sewage systems break down over time and allow tree roots to enter the line. Our team of emergency plumbers and drainers carry specialised drain cleaning equipment to ensure a fast and effective solution. Dux Service Brisbane – Installation, Service & Repair.